All at IRF Geneva are delighted to share with you our first Newsletter of the New Year. We join in conveying our warmest best wishes, and trust that 2013 will be a fruitful and rewarding year for you all, both professionally and personally. Here at the Secretariat, we are gearing up for the IRF Regional Conference: North-Africa and Mediterranean, which will be held on 19-20 March 2013 in Marrakech, Morocco. A dynamic programme awaits you, including a high-level segment; panel debates; plenary sessions on Urban Mobility, Interurban Road Links and Road Safety; two exclusive workshops on Green Public Procurement and Intelligent Transport Systems and a small exhibition area. By bringing together such a variety of programme choices and influential connections in a splendid resort destination, we have tried to present you with an opportunity you simply cannot afford to miss. Reserve your seats now! Marrakech will, furthermore, be the venue for our General Assembly meeting on Monday 18 March, as well as for meetings of the IRF Road Financing & Economics Committee and the IRF Group of Experts on Road Safety. We are similarly proud to announce a ‘first’: a new series of IRF Webinars with a pilot session devoted ‘Data Collection & Statistical Practices to Support Road Safety Policies’. 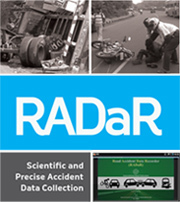 This online seminar, organised and moderated by the editor of the IRF World Road Statistics, Dr. Cristian Gonzalez, will address the highly topical issue of how best to organise and coordinate road accident data collection systems with a view to enabling improved analysis. The Webinar will take place on Thursday 7 March 2013 at 10.00AM CET and offers members a prominent opportunity to exchange views with their road sector peers worldwide. To register or for more information, click here. These are just a few examples of our ongoing efforts to extend and improve the range of our services to IRF members. Did you know, for example, that you can now have your company’s latest news prominently displayed on the IRF website? To find out more, please see: www.irfnet.ch. The Transport Research Board (TRB) week in Washington DC has been as usual a busy week for IRF and its members. Many of them have been presenting in the official programme, exhibiting and/or hosting receptions which have provided valuable opportunity to connect with the extended IRF family, partner organisations and the profession as a whole. We take this opportunity to thank our member, Cambridge Systematics, who has hosted many of us at its traditional TRB reception. A 3rd meeting of the Task Force on Measuring Spending on Investments in Transport Infrastructure was organised by the International Transport Forum (ITF) at the OECD in Paris on 29th January 2013. IRF Geneva belongs to this selected group and it is represented by its statistics and data expert, Cristian Gonzalez, who has been invited to contribute to the Manual of Best Practices devoted to measuring transport infrastructure spending and assets. Further to the report given in our previous Newsletter, we are pleased to advise members that the full proceedings for the 7th IRF Regional Conference: Road Safety on Urban and Rural Roads are now available online. Hosted by IRF member TTS Italia, the IRF Policy Committee on Intelligent Transport Systems (ITS) and TTS Italia jointly organised a one-day workshop on Fostering ITS Policy. The workshop took place in the city of Bologna, Italy, on Wednesday 5 December 2012. It was held in conjunction with TTS Italia's second edition of the Nuovo Mundo conference. An online meeting of the IRF Road Financing & Economics Committee, made possible with the support of IRF member ARUP, took place on 21 November 2012, to discuss progress in its activities. Through a screen sharing and internet conference tool, committee members were able to follow and discuss presentations. The next meeting of the IRF Group of Experts on Road Safety will take place on Monday 18th March 2013 from 14:00 to 17:30 at the Hotel Pullman Palmeraie Resort & Spa, Marrakech, Morocco. 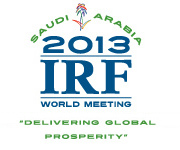 The meeting has been scheduled to coincide with, and tap into the major IRF Regional Conference: North Africa & Mediterranean (see separate article) which will be taking place at the same venue over the following two days, 19-20 March, 2013. A delegation of Chinese officials representing Chinese public transport companies and transport media paid a visit to the IRF Geneva offices during its European study tour on Tuesday 15 January. The delegation was welcomed by Mrs. Caroline Visser, Deputy Director General, Mr. Cristian Gonzalez, Project Officer Data & Statistics, and Mr. Barry Gilbert Miguet, responsible for media contacts within the IRF Geneva office. 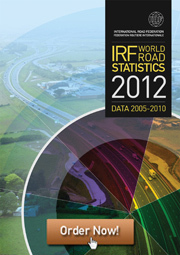 IRF is very proud to announce that the International Energy Agency (IEA) uses the historic data of the WRS for the costs forecasting of road infrastructure capacity through 2050. On January 2013, the conclusions and results of this methodology were published by the IEA Directorate of Sustainable Energy Policy and Technology (SPT) in the information paper "Global Land Transport Infrastructure Requirements – Estimating road and railway infrastructure capacity and costs to 2050".